There are some fundamental things that determine or dictate the way we are and to a great extent, what we do. In simple terms, this situation is believed to be affected by who your parents are, from whom certain attributes are inherited; the environment in which you live in terms of the limitation or opportunities that the physical environment confers and the exposure it allows. Other factors, which are of great relevance in this regard, are the custom and tradition; the norm of the society into which one is born and in which one lives in terms of their intrinsic value systems. In considering the Ondo situation, it is only natural to evaluate her against the backdrop of these identifiable parameters even though the list cannot be regarded exhaustive. There are not enough authentic records on where the Ondos originate. Some say that the Ondos were part of the large movement during the diaspora from North Africa and part of South East Asia. Others regard them as part of the mythical empire established in Ile-Ife by Oodua. 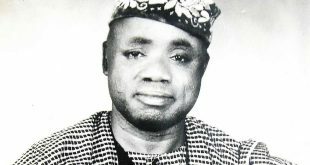 Recent history has also established the existence of such people known to Ondo history as the Idokos, the Ifores and the Okas. All the communities had found their way into the physical location now known as Ondo as a result of the survival surge. In fact, and this can be a veritable conclusion, that order and some governance came into Ondo society as a result of the incursion of the progenies of Oodua from Ile-Ife, who, on their arrival on the scene, commanded acceptance as the mythical and spiritual source of the Yorubas. They changed the existing chaos to order. We do not intend to dwell on this issue in depth as it may create an unnecessary diversion from our real intention. Suffice it to say that the Ondos claim an ancestry, which is basically Yoruba, regardless of how and from where they are, to settle in a place now called Ondo Kingdom. The Ondo race had developed some language systems even though varieties occur within its settlements that evolve their own vernaculars with or without affinity to the basic language of the Yoruba people. The Yoruba as a people are also noted for their culture of monarchical supervision under the umbrella of a metaphysical deity. The culture of hierarchy and levels of authority are well embedded in the ordering of their affairs. The Yorubas are also well known for their culture for hero-worshipping and due-followership, despite a selfish inclination to protect their own and foster their species; a culture for art and crafts imbued by a tradition of skill and intellect; a non-egregious inclination, as independent and proud people which could be traceable to their circumstance during the early period of the myriad of independent kingdoms, which virtually distinguished them form other groups. 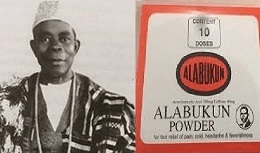 The Ondos had the advantage that no foreign culture was ever imposed on them to destabilise their basic culture and tradition despite the activities of military adventurers from Ile-Ife and Benin who wanted to be part of the great advantage that the entrepreneurship of the Ondos created, particularly in the 18th and 19th centuries wherein the Ondos dominated the trade and commerce of outlying kingdoms such as Ikale, Ile-Ife, Ijebu and Benin. It was the envy engendered by the success of the Ondos in cornering the trade and commerce that thrived in the 18th 19th century that brought about the strikes and skirmishes of the period, but from which the Ondos were effectively insulated by shifting their base temporarily to Oke Opa only to regroup in Ondo town. Against this background, the Ondos grew as a metropolitan city in a small area, admitting others into its fold, but not giving in to strange culture. The idea of living whilst allowing others to live, as shown in the way the Ondos welcomed foreigners whilst protecting their own, could be linked with the present day attitude exhibited by the Ondos, of holding tenaciously to what is their own and protecting it and not being enamoured about what happens to anyone else. It could also be responsible for the success, which has marked out the Ondo as achievers because of their tenacity to succeed in whatever they do so as not to be subordinate to anyone. The penchant of the Ondos to detach from issues, as long as they do not have an impact on their lives, can also be traced to their long period of isolation and insulation from outside influences. I am sure the above list is not exhaustive. but we believe that they are sufficient as the platform from which to deal with the issues at hand. It is almost impossible to find the Ondos agree to take same and single position on any issue. They can be totally inflexible. “Po du o ku ti” syndrome that some of our detractors call it. The consequence of this is that we are not great politicians whose core strand is compromise. This attitude also breeds dichotomy when issues that should be of concern to all occur. The Ondo person is generally very accommodating of strangers. It is because, from foundation, Ondo was an entrepot for all the trade and commerce that was available amongst the Ikales, the Ekitis, the Ifes, the Ijebus and the Benins. This disposition has been carried to extreme under present day attitude of virtually walking out of ancestral heritages and farmland for strangers to occupy, either on temporary, and more often, on permanent basis. The Ondos, on the other hand, are not adventurers. They hardly relocate permanently to other lands, hence the penchant for giving derogatory and uncomplimentary appellations to neighbours or strangers such as Ishans (aimless wanderers) Kobokobo (ie discordant tunes) and more recently Koololos (ie are you dispersing) translated literally. Whilst the Ondo man may not be interested in what you are or what you are doing, he, however, jealously, guards his own territory, chasing intruders away. This quite often is carried to its logical conclusion, culminating in selfishness. This attitude must have been borne out of centuries of isolation and the need to survive in a small out of the way Community. As we all know, the survival instinct can also lead to a primitive instinct. This attitude may also be responsible for the disinclination of the Ondos to cooperate with one another so as to form a common front. It is everyone for himself and God for all syndrome. The Ondos are the envy of all its neighbours because of their entrepreneurial ability for centuries. The Ondos have thrived in trade & commerce because of their metropolitan attitude. They also are great consumers of ideas, particularly those they regard as favourable to their disposition. It is this entrepreneurship attitude that gave the Ondos early prominence , and persistence in it in modern times has also given the Ondos the edge over its neighbours who readily agree that when it comes to trade and commerce that it should be given to the Ondos. The fact that Ondos succeed in doing whatever they chose to do by undaunted application to hard work, so as not to be a failure to be ridiculed by the cynical society out there, has also been a great impetus. The underlying strand to this position comes from the feeling that there is no one out there who will help you out because everyone is busy doing his own thing, unmindful of others. The Ondos are known for their concern for order and cleanliness. Their concern for the clothes they wear, the environment in which they live, the pride they have in their institution and traditional norms, the pride to speak the dialect in preference to any other dialect and language, the order and observable hierarchy in their traditional authority system, the sense of order, as can be seen from the way Ondo Town is built with street hitting one another at right angle long before Town Planning came into existence, all go to emphasize the respect Ondos have felt for order and civilized behaviour. They could go to any length to defend these attributes in order to sustain them. This is typified in the swan song that is very popular in Ondo and whch is on the lip of every Ondo man and woman. “E e si, e e si o, E e so nuya n ‘mo’ ndo oe! 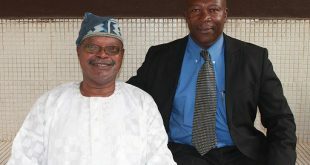 !” Which, if literally translated, means that the Ondo are sophisticated, highly cultured and good value oriented people. The amazing thing is that all those five profiles that have been defined to delineate for the Ondos are virtually inclusive in that they make the total person, and more important, these are virtues, which though they may appear negative, can be harnessed to build a new prosperous, viable and sustainable society. Now that we appear to have acted out some dramatic sketches in a play that has only attempted to define a caricature, we need to move away to the bigger theatre of action and creativity that will be relevant to new things that are happening all around us. There is this tendency to want to leave issues of general concern in the hands of one or two people that appear to us to be in a position to act, even though we have not made any contribution to the status of that one person as if that person only is the one to blame if things go wrong. This is an anathema because the Ondo culture is totally abhorrent to this as can be inferred from another song of Ondos: Bi ola, Bi ola, Adodo fusi seti omi, Luwa mon fusi s’Ondo, Ola ma ti bokan wa aiye o e (3ce). The corollary to this attitude is again how the Ondos hide their talents such that they don’t get known for their achievement so as to get global recognition. The consequence of this situation is that, even though there are enough Ondos of leverage, they are not prepared to come out and be counted for the Ondo cause or causes. When such people get bye-passed, they blame others for not doing enough for them to be recognised. No one should expect to reap from where he did not sow. For me, one of the most important things now is to continue to preach to the Ondos the importance of an old adage, which says that there is a lot of strength in Unity. Any instrument that can further this attitude is an essential ingredient in the level of success achievable by the Ondos. The remarkable positive impact that the establishment of the Ondo Development Committee, the Ekimogun Day celebration and the Ekimogun parliament have made in development activities underscore the importance of such and similar institutions. The social and patriotic clubs, which flourished at the start of Ekimogun Day festival which, are also great instruments of cohesion and mobilisation helped tremendously in fostering the ideal. They should not be allowed to fizzle out. The ODC should take particular interest in those clubs. 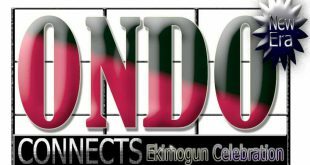 Looking at the statistics, more than 50% of the clubs and societies that used to participate at the Ekimogun Day festivals have failed to show appearance in recent Ekimogun Day celebrations. Let the ODC investigate. Is it sheer apathy, disagreement or schism within the fold? Some interventions may do the magic. We all enjoy the aura and pride that the Ondos enjoy everywhere because of the track records of some great Ondo achievers and role models. We need now to invest heavily in this heritage to be able to sustain it. This Ondo society needs a renewal because it is weakening even at those things it used to know how to do best. This is not unnatural. Even the tree grows old. So does a city. There is an Ondo anecdote which says: Akiko ba mi ogha gha gha, Akiko ba mi ogha gha gha, Ete ti hen ti gbo wa”. Our Society needs invigorating, replenishment and re-engineering. This can be done through the introduction of creative projects, initiated by individuals and groups that are desirous of reversing this disastrous end. Oba Airo did it some five centuries ago. It can be done now. It can be done through intervention in dilapidating infrastructures, social service and industry. It can be done by the introduction of creative and new processes at the way we do things such as forming the arts and crafts, festivals and celebrations and fundamental change in psyche to try and be our brother’s keeper. We all need to revisit that tred that deter us from cooperating with efforts to improve the Ondos society because; at the end of the day people will invest in the Ondo because nature does not allow a vacuum. For now, it is the Ota Akunnara through Iparuku Street, the Odotu through Ododibo Street, the Oreretu through Enu-Owa Igele Maroko to Odojomu shops that are being owned by foreigners. Very soon, they will own the houses that begat the shop through deliberate action or default. One world is enough for the wise. The Ondos are renowned for their entrepreneurship, but how well are we failing back on the age long attributes and capabilities. The 18th and 19th Century stories of active trading in the Yoruba country had the Ondos as great players. Then it was trading and commerce. Now it is industry and technology. How do we rate as players in this field? Industrialization through small and medium scale enterprises development are the key issues for modernisation and for wealth creation. How active are the Ondos in the pursuit of these endeavours?. Things have changed. The Ondos entrepreneurs of the 18th and 19th centuries whose main concern was to make some profit from our ability to harness resources of other people through effective management has given way to opportunity, identification, resource building and the creation of new environments that mere are still of the old school. Their scope is limited and their growth stunted. The challenges out there are for the new type of entrepreneurs. My conclusion is that there are not enough of the new breed within the Kingdom. There is a critical need for injecting new blood, with wherewithal of the modern enterprise as described above. You are retired or about to retire. You have had tremendous training and exposure. In some cases, you have acquired some resource in excess of your primary need demands. Tell me why you are still sitting down, waiting for Gordoh, in strange land “Gordoh” may never come. If I were you, I will close shop now and come home. The opportunities are wider and the requirements are less suffocating as the results must be satisfying because it is not just you, it is adding value to other lives. If you have some investible funds through hard work and God’s grace, why don’t you use it to add value to the life of others rather than just increase your income for the sake of it. Twenty of your like joint action can give scholarship to the deprived and disadvantaged, provide employment for the unemployed who may be your distant relatives with whom you have lost contact, having been away from home for too long. to a whole lot of people who will otherwise not have been privileged if you fail to do what you ought to have done for its own sake rather than to gain power, recognition or profit. (a) If the Ondos can combine their penchant for the sophisticated and civilized, with a dose of selfish behaviour, spiced with a little metropolitan and accommodating attitude, salted with a good entrepreneurship principle all well cooked and seasoned in a cauldron of cooperation the Ondo society will be much greater and better developed and more renowned than it is. (b) If the Ondos can moderate their cynical attitude in favour of an attitude that encourages the principle of being one another brother’s keeper, there is no doubt that the Ondo will fly like eagles and not be weary. (c) If the Ondos can accept that there is another world out there waiting to be “colonized” and that is loaded with attractive opportunities, they would easily break away from their isolationism, using their vision and entrepreneurial capabilities for which they are known and through which they have become great achievers. The Ondo society will not be the same for great things at no distant future. We all need to build a new society where the success and harmony of the majority is the rule rather than the exception. We need to build a new society where the success and harmony of the majority is the rule rather than the exception. We need to fund institutions. Both social and economic through cooperative efforts in the firm understanding that one hand cannot easily put a heavy luggage on the head. We need to understand that the small contributions of many people to development efforts rather than the huge dose from a messiah, that may never come, is more effective, more satisfactory, more enduring and more inclusive than what one individual or government can do. We need to foster institutional growth at the expense of individual aggrandizement. We, as a people, need to take on the challenges of the present situation of things and change the situation for good. This is indeed the time to build through our cooperative efforts, new cities, new persons, and new infrastructure to replace dilapidated ones. Let us agree to take the first step now so as to advance in the travel ahead. All Ondos have a part to play in this great movement for the sensitization of our people and the emancipation of active ideals such that it may be said of us “we did what was within our means to do”.